Al Mulla Rental & Leasing of Vehicles & Equipment CompanyÔÇÖs Service Centers are ISO 9001:2000 certified since 2008. 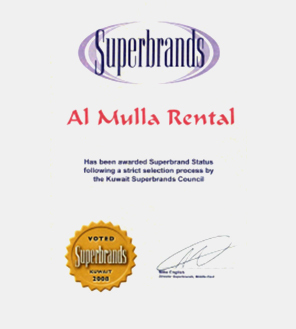 From 2008, Al Mulla Rental & Leasing Co. has been recognized as a prominent Kuwaiti Superbrand. 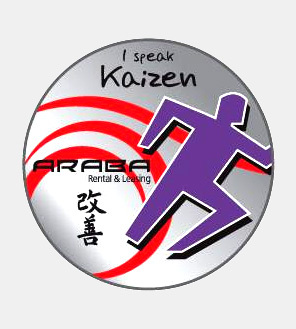 I Speak Kaizen - The Kaizen philosophy was adopted by to increase efficiencies in its processes. 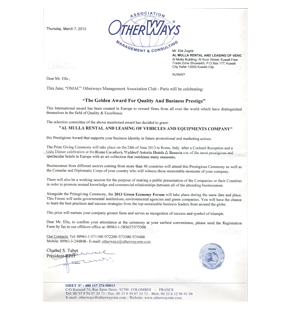 Another Golden Award was presented to Al Mulla Rental & Leasing Co. in 2013 for its quality and business prestige by OMAC ÔÇô Paris.